The pair of shops at 56 and 58 Angove Street have stood for more than a century. Their aspect in the streetscape has remained relatively unchanged and they have witnessed various businesses and owners come and go. A classified advertisement placed by the owner Frank A Hahn West Australian in 1919 describes the dwelling and the shop fittings in detail and its location opposite the North Perth School which opened in 1899. Hahn, who ran a motor garage at number 58 advertised cars for hire, with weddings a specialty. Frank Hahn’s well-known wife, Ethel, made decorative arrangements with artificial flowers and she had a display at the “Cheer-up” exhibition of WA manufacturers and industries at the Perth Town Hall in 1916. By 1920, Frank had opened an ironmongers shop at number 56. 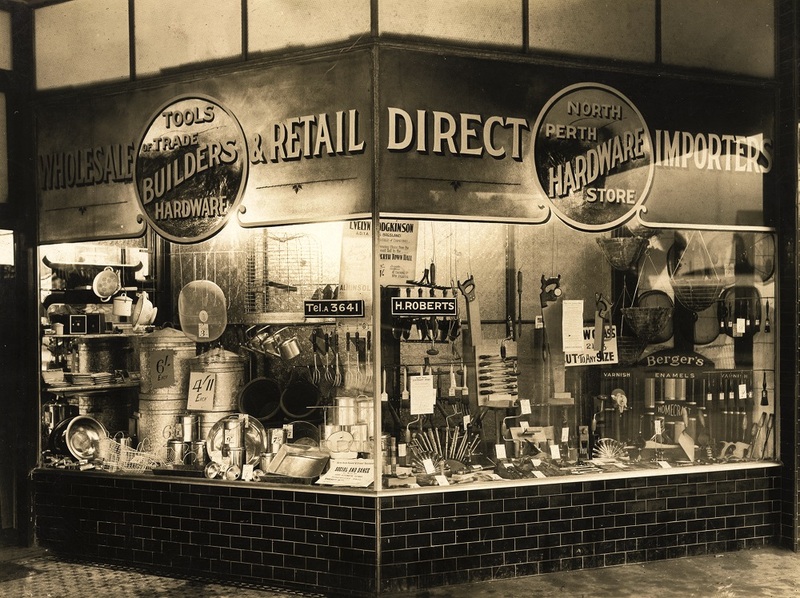 Horace H Roberts was the proprietor of the North Perth Hardware Store from 1921 to 1948. 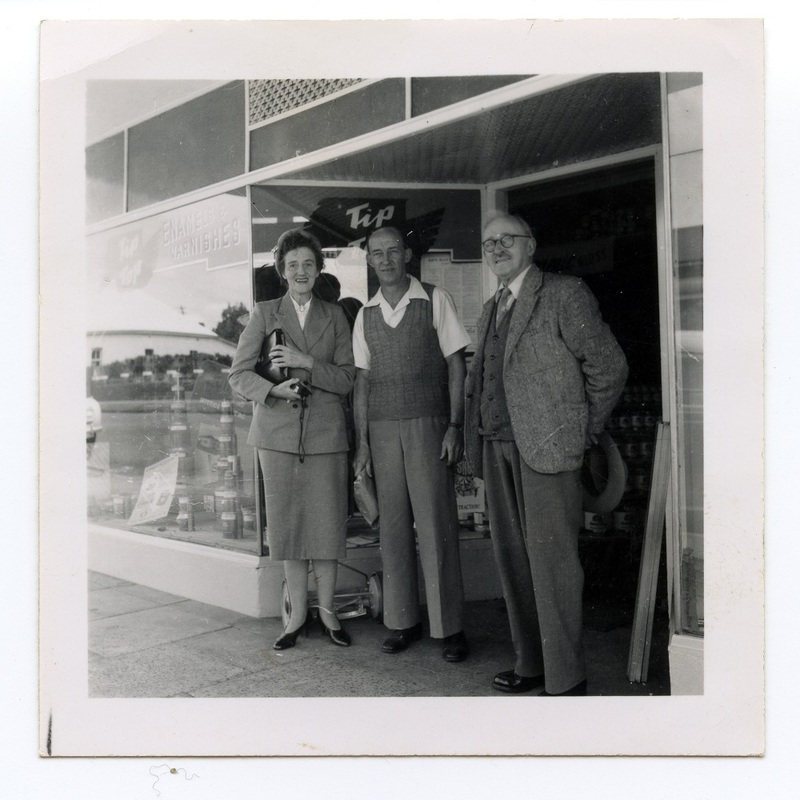 Before going into business on his own, Mr Roberts had worked at Bairds in their paint and hardware department. During this period most suburbs had small hardware stores run by sole traders. Their range would include kitchen items, homewares such as drinking glasses, supplies for the home handyman and craftsman, small building supplies, paints, household chemicals, pest control, gardening tools, rope and other general items that locals may need to purchase for their home and garden maintenance.As well as running the ironmongers/hardware shop, Horace Roberts did maintenance work on windows for local people. In those days they had cords and he replaced broken ones and broken window panes; he also made fly-wire doors for people. Oscar Hanke purchased the shop from Horace Roberts in 1948 and changed the name to Hard-Elects. He later moved to Charles Street. In the 1950s the shop became Church & Co, a paint and chemicals distributor, and sole WA distributor for Melbourne company Gibson’s range of detergents and polishes. “We design and manufacture home wares and gifts that are Perth themed or related or inspired by either the WA environment or industry. I do all of the illustration and my husband heads up the manufacturing side of the business. Future Shelter manufactures and designs homewares and gifts, screen-printing and laser cutting their designs on site. The large machinery required more workshop space, and for a time Jane and Adam sub-leased space at number 58 to run their workshop. 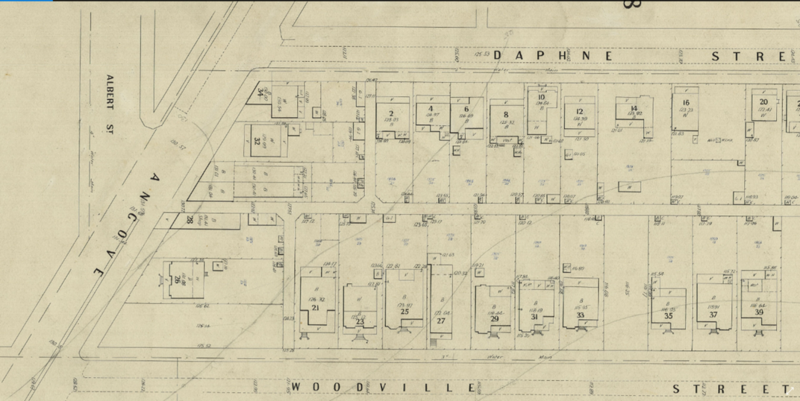 When they outgrew that space, they moved their manufacturing to the former Midland Railway Workshops. 58 Angove Street is now home to Baklava Kafe.